Mystic Farms is a local leader in creating natural, affordable skin care products. 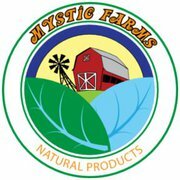 Mystic Farms Natural Products is committed to making premium, effective, all natural skin care products. We are a small family operation located in Oakville, Washington; in southwest Washington state. What started as a quest to understand the ingredients in commercially available skin care products has become a passion for creating natural products with simple ingredients customers can identify and recognize. By using only common plant products and beeswax, we hope our products are safer, gentler, and less likely to cause allergic reactions. All of our products are free of parabens, petrochemicals, and synthetic fragrances. Because our workshop is powered exclusively by solar panels, we like to think we're gentler on the environment too. Our customers have a lot to say about our products. To read their opinions click ﻿here﻿.